from the wonderful >The Scout Report, Copyright Internet Scout Project 1994-2007.
from the RAC Health listserv a service of the Rural Assistance Center. For additional services and information, see the RAC web site at http://www.raconline.org or call 1-800-270-1898. The purpose of this program is to provide grants for the conversion of some or all of the dwelling units in an eligible project into assisted living facilities (ALFs) for frail elderly persons. Aimed at designing solutions to meet the needs of older generations that will also meet the needs of younger generations. Examples from around the country include developing new school curricula that encourage young people to go into health care fields, designing walkable communities that improve the health of all generations, and having after school programs share sites with senior centers. A user guide complements the toolkit. Mary Ann Sundown (click to read previous) and her sister have a video on YouTube, courtesy of her son, from a recent basketball tourney intermission. The BCCDC will be conducting face-to-face or telephone interviews with British Columbians who were born in 1908 or earlier and have a lasting memory of the 1918-1920 pandemic. If you know of someone who has a compelling experience and might be interested in participating in this survey, please contact Westcoast Clinical Research at 604-524-7141 or by email at wccr AT telus DOT net. Dr. Black survived Stalin, forced labor under the Nazis, refugee status, and never suffered fools, the pompous, the bully, nor laziness or sloppy scholarship. She was fond of cats, dogs, children, and those needing a friend in a strange land. Widowed with young children at 44, she went to college and finished her BA and MA in two years and her Ph.D. in another two years. She studied at Northeastern University and Brandeis University in the Boston area before receiving her doctorate from the University of Massachusetts Amherst. She joined the faculty of anthropology in 1973 at Providence College in Rhode Island. 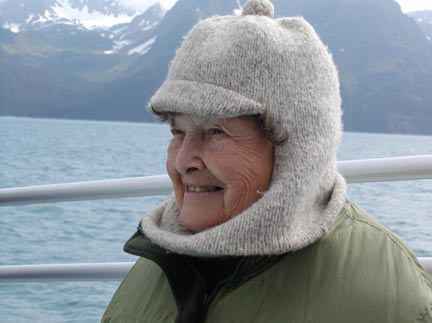 She moved to Alaska in 1984 as Professor, University of Alaska Fairbanks, whence she “retired” in 1998. She continued her work in Kodiak, where she helped translate and catalogue Russian archives of St. Herman’s Seminary. The Orthodox Church in Alaska recognized her contribution by awarding her the Cross of St. Herman. She wrote at least 66 more books and articles appearing in publications as diverse as Natural History, Arctic Anthropology and Studies in Soviet Thought and was a contributor to various exhibits and conferences on the Arctic, including the Library of Congress’ Meeting of the Frontiers, the New York Museum of Natural History’s Jesup Centenary Congress and the Smithsonian Institution’s Crossroads of the Continents. One of her best-known books, “Aleut art — Unangam aguqaadangin” is a collection of beautifully photographed and carefully documented art made by Alaska Natives of the Aleutian Islands. Another, “Russians in Alaska, 1732 to 1867,” was published in 2004, the year Lydia turned 79. In 2001, Russia awarded her the Order of Friendship, honoring her contribution to promoting cross-cultural understanding between Russia and America. She received the Alaska Anthropological Association’s Lifetime Achievement Award in 2000 and the Alaska Governor’s Lifetime Achievement Award for the Humanities in 2005. Lydia was born in Kiev, where her grandmother came to live with the family. Her grandmother instituted an educational regimen for her which included two days per week of speaking Russian, two days per week of speaking French and two days per week of speaking German. On Sundays, the family could relax and speak Ukrainian. It was decreed that Lydia would study English in school. Lydia’s grandmother would take her to the ‘secret church’, hosted by three elderly women – the KGB eventually did arrive to arrest them. Lydia’s father was executed when she was eight years old. At 16 (1941) her mother died of TB. Lydia was picked up into forced labor for Germany. At war’s end, Lydia was in Munich and got a job scrubbing toilets in American officers’ quarters. They realized Lydia could speak six languages (she had learned Polish during the war) so she became a translator at the UNRRA’s displaced children’s camp. Lydia met and married Igor A. Black. They then emigrated to the U.S. in 1950. Igor became a thermodynamics engineer whose work on the Apollo Mission was officially commemorated by NASA. Lydia was a full-time wife and mother. Suddenly Igor died in 1969, leaving Lydia alone with three teen-aged daughters and a toddler. With her older daughters’ consent, Lydia returned to school as a full-time college student. 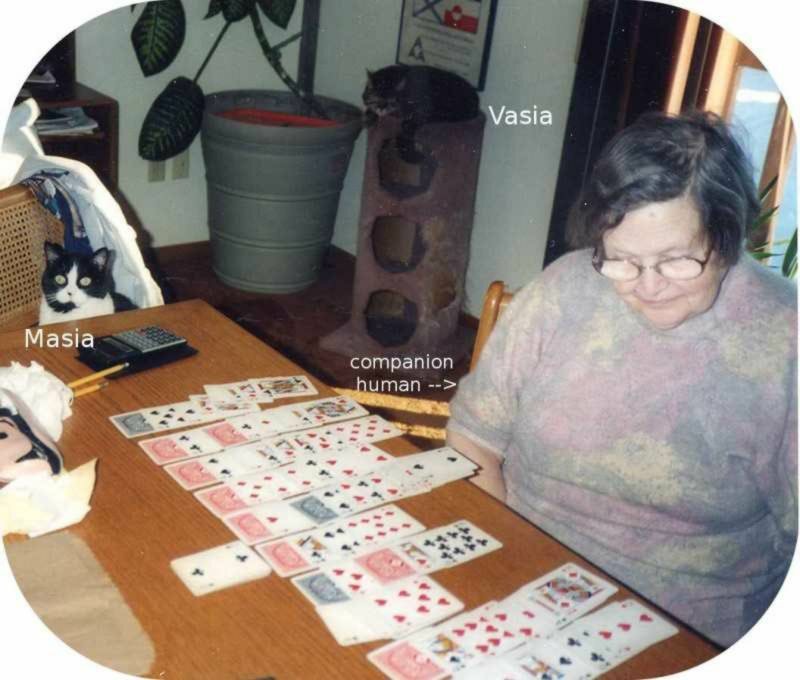 Dr Black died in Kodiak, AK, with family, friends, Orthodox services, and the feline sibling companions Masia and Vasia present. audio file (mp3 format), click to play or right click to download and save. A say in one’s or other’s life? The gray area between competency and incompetence is one of the most difficult dilemmas any family can face. We went through it when my mom was in the early stages of Alzheimer’s, and it was hell. I urged the daughter to take her dad to a physician for a diagnosis to know for sure what’s going on. But until he’s clearly mentally impaired, he’s in charge of his life. And here is another example of the difficulties that can arise. How do we even discuss this? The oldest jail inmate in state custody had a massive stroke Friday and the state immediately dropped the charges against him so he wouldn’t spend what could be his final days under a cloud of criminal allegations, prosecutors said. Charlie Parks, a 90-year-old whose family says he suffers from dementia, had been in jail for three months. He was facing a felony assault charge that claimed he tried to stab his caregiver in an assisted living home in December…. But defense attorney John Bernitz said the incarceration of his client shows a fault with the state’s system. “I don’t know who is personally responsible, but we as a community could have treated him better,” he said. In November, Parks, a school teacher for 40 years, packed his frying pan, clothes, crystals and meditation books into a tattered plaid suitcase and sneaked out of his assisted living home in Kalispell, Mont., ahead of spirits he thought were chasing him. He cashed his Social Security check and bought a plane ticket to Alaska. Once in Anchorage, he took up residence at the Days Inn on East Fifth Avenue… His hotel bill mounted and the Veterans of Foreign Wars chipped in before hotel staff found Parks’ daughter, his only child, in New Mexico. She contacted Alaska Adult Protective Services and Parks was moved to a five-bed assisted living home in Russian Jack. He had been there for little more than a month when, in December, he took a 4-inch serrated steak knife to his caregiver, prosecutors said. The caregiver was grazed by the knife. In the summer of 2001, noted author Eudora Welty passed away in her home state of Mississippi. Throughout her ninety-years she made significant contributions to the art of the short story and other literary forms, and she remains the subject of scholarship and admiration in many quarters. From The Scout Report, Copyright Internet Scout Project 1994-2007. Ms Welty also gave her name to the popular, eminently useful E-mail program, Eudora .